Get started with using Blumats in a simple, low-cost way. If you only have a few plants or you’d like to learn how Blumats work before converting over to a larger system, this kit may be just right for you. Includes 5 Blumat carrots, a thru-the-hull adapter for attaching to a reservoir, an end piece and a 7M roll of the Blumat 8mm tubing. Increase your yields, decrease your grow times, save time, water and nutrients – and still have healthier, tastier, faster growing, and more potent crops. Includes five 5” carrots & all parts for a gravity system. Reservoir should be at least 3′ above ground level. Optional pressure regulator attached to garden hose or faucet and can provide enough water for up to 500 Blumat Carrots. Reservoir should be at least 3′ above ground level. 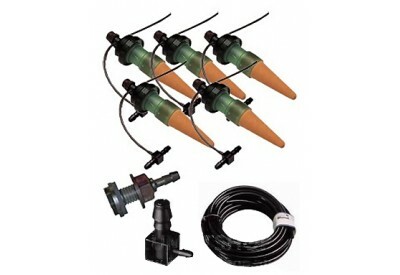 Optional pressure regulator attached to garden hose or faucet and can provide enough water for up to 500 Blumat Carrots.